Look and feel your best with fuller, thicker hair. LookWell offers HairSoReal, a safe, natural, and easy-to-use solution to thinning hair and balding. Since 1996, people all over the world have turned to this revolutionary product to combat their hair loss. Whether the problem is bald spots or a receding hairline, HairSoReal has helped conceal these problem areas, creating a more flattering appearance. 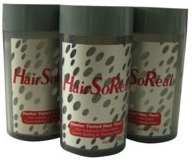 If you're struggling with hair loss, try HairSoReal. It's the ideal solution for anyone who wants to have hair that is thick and full of life. HairSoReal is a doctor-tested, nontoxic alternative to expensive surgical procedures and drug treatments that helps thicken your existing hair. It's a hair powder, featuring artificial hair fibers that are textured to look exactly like your natural hair. It comes in several different shades, including black, brown, and silver/grey. HairSoReal will take years off your appearance, help you regain your confidence and spontaneity, and — most of all — resolve your chronic hair loss problem. Order HairSoReal today to improve your hair's overall appearance.